When it comes to relaxing and rebooting, getting away from it all—the always-late trams, the endless Punt Road traffic, the two-hour queues for a doughnut—the heart of nature really is the best way to hit the reset button. Here are seven incredible accommodation hot-spots that make for soul-restoring getaways, all within Victoria. Who knew holiday bliss was only a few hours’ drive away? 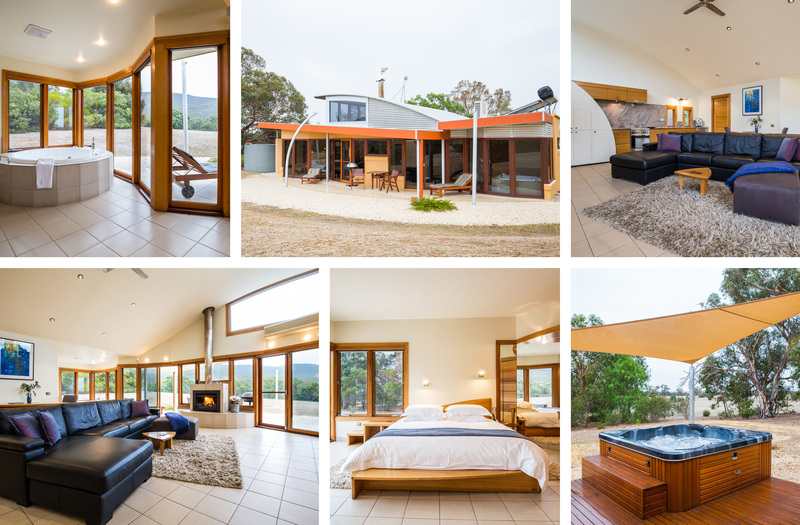 The Grampians is famous for its breathtaking natural beauty, so it makes sense to stay where you can make the most of it. DULC offer an architect-designed retreat far away from the built-up environment. Five cabins are set across five acres in secluded woodland. The treehouse-style cabins feature lofty bedrooms and sunken spa baths, while the single-level cabins are furnished with soft leather couches for cosying up beside the gas fireplace. A highlight is the floor-to-ceiling glass in the bathrooms, which allows you to feast your eyes on the rugged terrain while lathering up your hair. Close by, Harvest Halls Gap offers breakfast and lunch, together with tempting shelves of take-home produce, including craft-brewed lager. Seriously, is there any reason to return to the city?! The two Bright guesthouses of Beyond Bliss are a combination of cosiness and luxuriousness. They each feature spas, rainfall showers and hampers stuffed with local produce on arrival, meaning you pretty much never have to leave. The bathrooms are even stocked with all the MOR products you can handle! Fancy. If taking in the sights from a vantage point is your idea of nature at its finest, you'll fall head-over-heels for Clifftop at Hepburn. 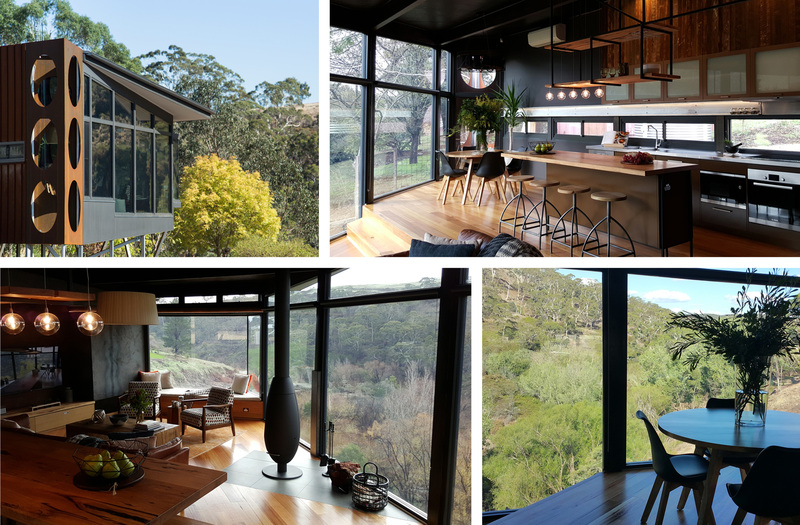 Situated amongst the greenery, quite literally on the edge of a cliff top, the stunning accommodation sleeps four people and comes complete with floor-to-ceiling windows, a suspended Oblica fireplace, and a Lord Of The Rings pinball machine—yes, we're serious! The ultimate holiday for those who live their nature with a side of geeking out. 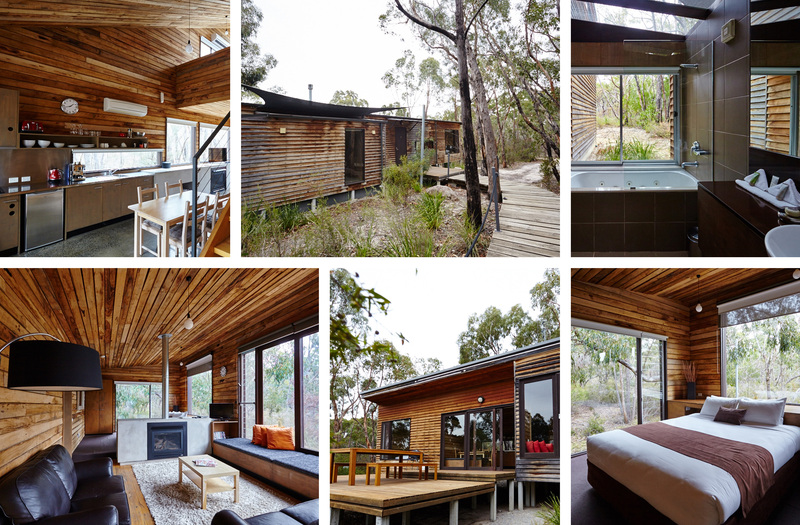 If escaping from it all in the surrounds of the bushland is your thing, you’ll want to lock in a weekend or more at Talo Retreat in Echuca, which is situated on one of the banks of the Murray River. You’ll have your very own private yurt (aka. snazzy tent) for when you want some alone time, with heaps to see and do when you’re craving some human, or animal, interaction. And after you’ve checked all there is to do on land, just hop on a river cruise to see some waterborne wildlife up-close and personal. Nature points = One million! From the outside, The Kilns look like the most luxe sheds we've ever seen, but inside it's designer styling all the way. Made up of three separate residences and inspired by tobacco kilns, each kilnhouse is scattered over a real Angus stud at the base of Mount Beauty, making for beautiful views of the surrounding greenery. Anyone else suddenly craving a medium rare steak? Yep, us too. Nearing Mount Buller, 187 Merrijig is set on 100 acres for you to—temporarily—rule. If you book both suites, you'll only have to share with a mini-donkey, a bunch of alpacas and probably the odd roo. Did we mention you get a lake and a jetty to laze about on too? Yep, if you’re headed to the hills for snow season, this place makes for a fantastic après ski pad. Who needs les Alps when you’ve got your own Merrijig mansion?! Victoria's beaches are best experienced when they're right on your doorstep. And at Big Blue Backyard, one of the most beautiful beachside accommodation hot-spots on the Mornington Peninsula, that's exactly what you get. Situated by St Andrews Beach, the Big Blue Backyard cottages are the epitome of luxury—think plush king-size beds, home-made treats to welcome you on arrival, and even a chef to cook you a candle lit dinner if you're turning the romance up to eleven. With wineries in one direction and the beach in the other, this really is paradise. 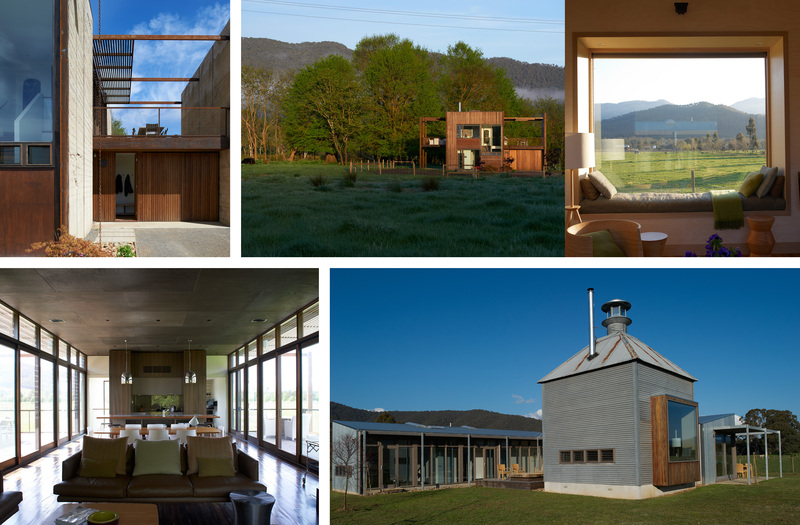 A short drive away, Boroka Downs offers light, airy lodges, which overlook majestic mountain views. Each lodge features a log fireplace and a spa, as well as a wide-screen TV and DVD set, king-sized bed and double hammock. The sleeping and living quarters feature glass walls but non-exhibitionists need not fear—the only other life forms you’re likely to encounter are kangaroos and emus. Binoculars for bird-watching are provided, as are backpacks complete with walking maps, so you don’t even need to make that pre-trip stop-off in Kathmandu. Score. Holidaying right next to Phillip Island’s penguin residents is pretty much the roadtrip dream, making Kitty Miller Bay Bed & Breakfast our favourite accommodation pick for the south of the state. This stunning waterfront venue’s accommodation suites each have their own entrance, meaning you don’t have to scare the living daylights out of your temporary neighbours when making a dash to the ocean for that midnight skinny dip… Or maybe that’s just me? For those who are looking for a more tame retreat, you’ll find a BBQ on site, and will have no problem finding the penguin parade, which takes place at the beach next-door. Melbourne’s an incredible city, but sometimes we all need to get out of town for a weekend. The Urban List has partnered with Visit Victoria to bring you our Get Out Of Town! series — the ultimate guide to Victoria’s regional gems. For more ideas about where to wander in Victoria, click here. Thank you for supporting the sponsors who make The Urban List possible. Click here for more information on our editorial policy.